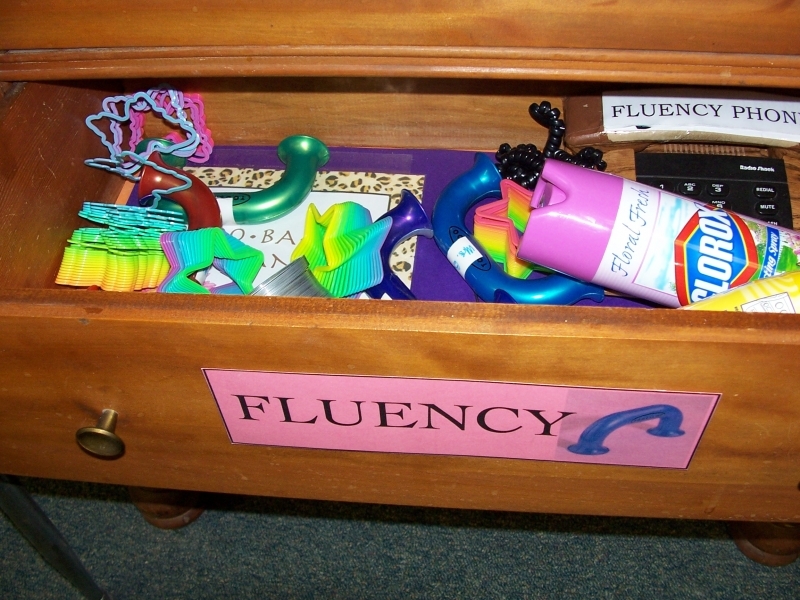 Teachers have been introducing the trait language to students in a variety of ways. 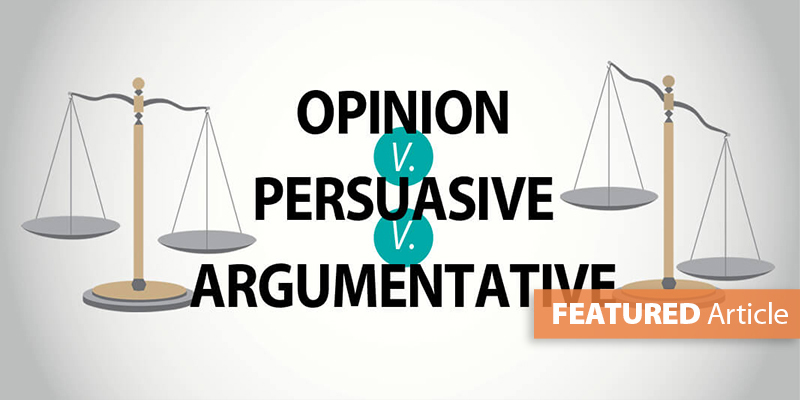 Here are some of our favorite approaches. 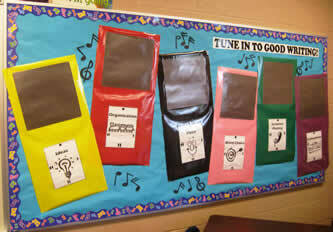 Click on some of the photos below for a larger view of the bulletin board. 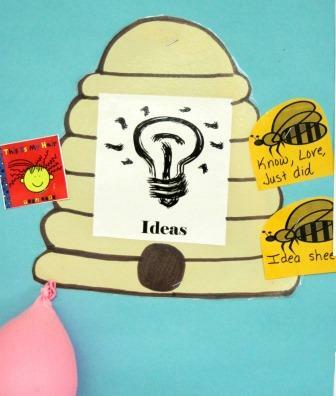 Thanks to all who have generously shared their creative ideas! If you would like to share digital photos of your trait introduction, email Kristina Smekens. 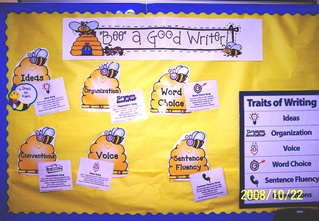 As first grade teacher Amanda Alsager at Lake Street Elementary (Crown Point, IN) introduced each trait, she built a "Bee a Good Writer" bulletin board. 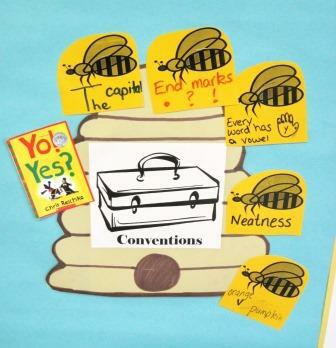 Each trait was represented within a bee hive. And since she taught her students Ruth Culham's 6-Trait songs, Amanda added the lyrics for each. 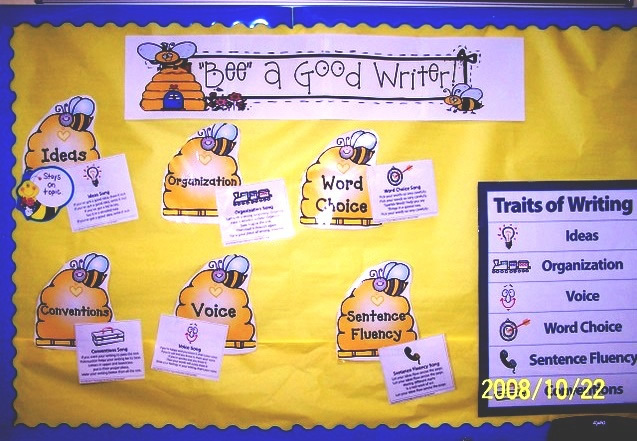 Similar to the approach above, the images from this first grade bulletin board show the numerous trait-specific skills added all year long. The overall picture was taken after the 6-day trait introduction. The six smaller pictures were taken in May of that school year. 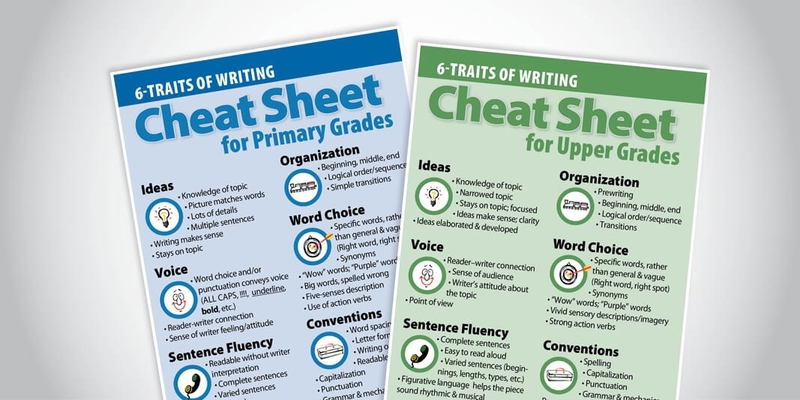 You may want to personalize the 6 Traits, making them more concrete and less abstract for young writers. Within this introduction, we introduced six characters, each representing one of the six traits. 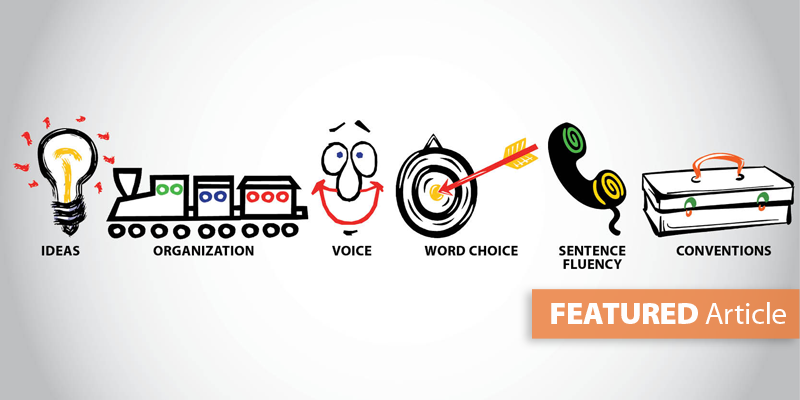 Each of their personalities captures the sentiment and function of the writing trait. 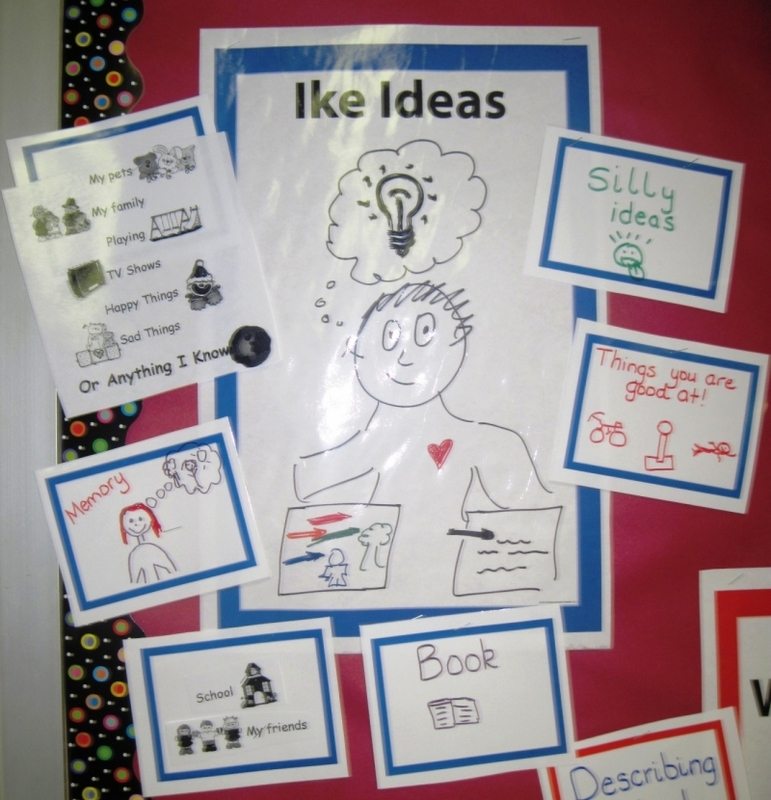 IKE IDEAS writes about topics he knows a lot about, and so should we. OLIVER ORGANIZATION appreciates everything put in order--1, 2, 3. 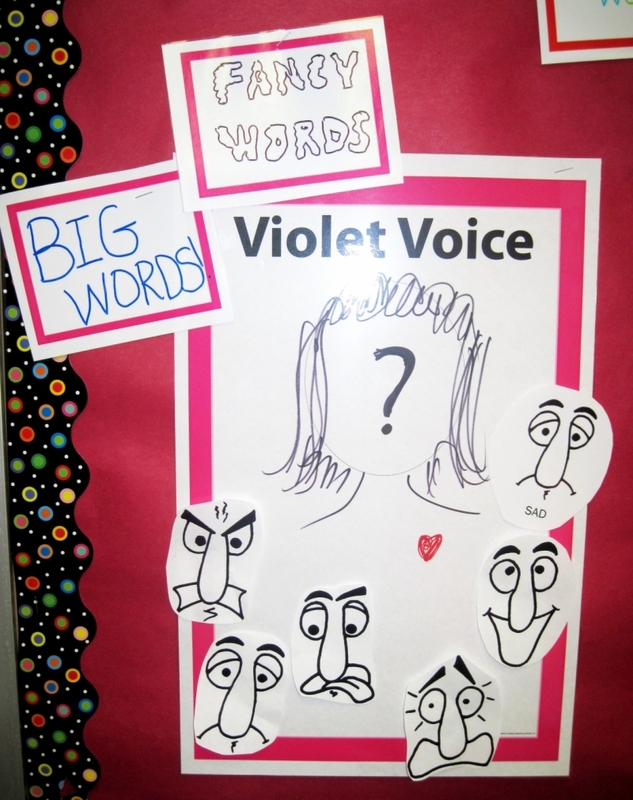 VIOLET VOICE reminds us to tell how we feel about our writing topic. 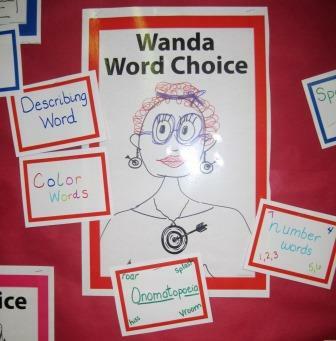 WANDA WORD CHOICE loves fancy, descriptive words. 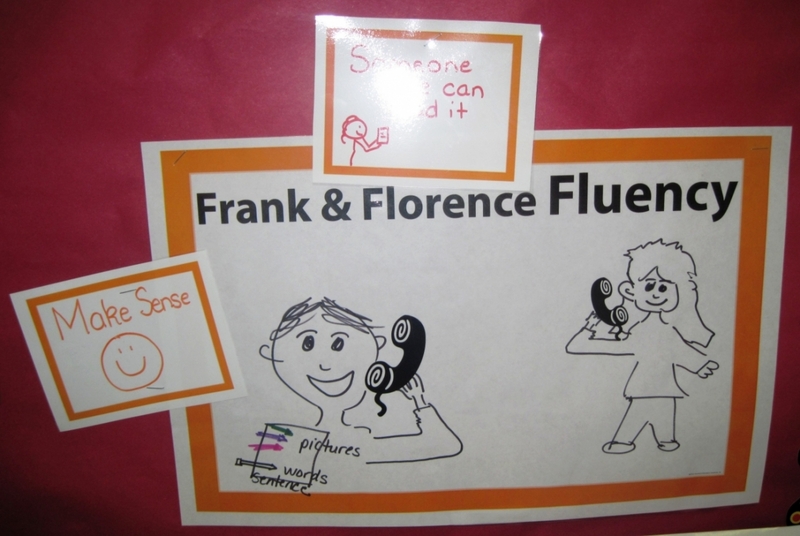 FRANK & FLORENCE FLUENCY read their writing aloud on the whisper phone, checking that is sounds good. 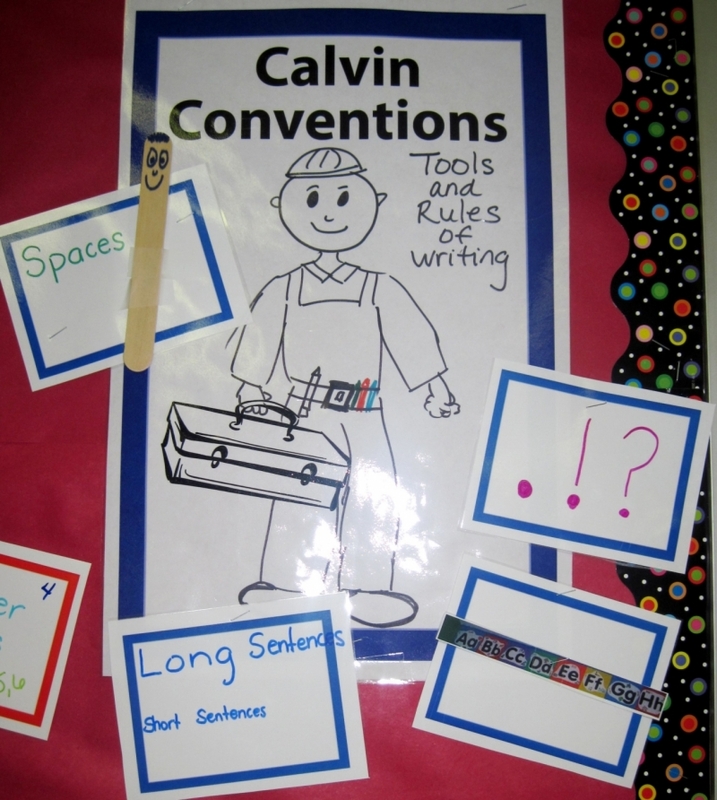 CALVIN CONVENTIONS reminds us to use writer tools to fix our writing. 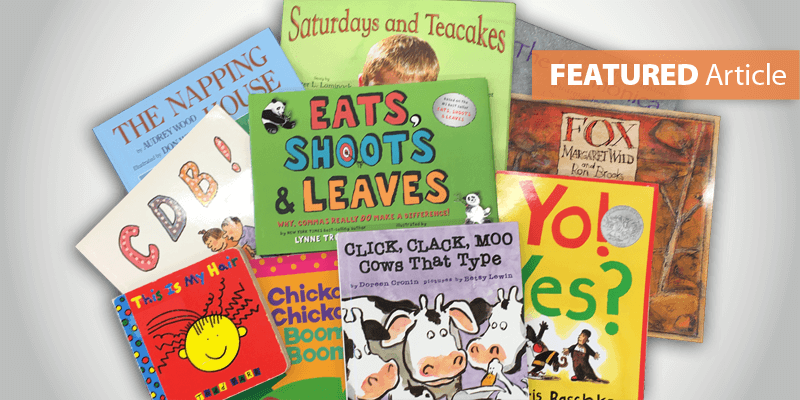 Once all six characters were introduced early in the year, individual writing skills were taught throughout the rest of the year. Those skills were each tied to a trait and added to the kindergarten bulletin board. These photos were taken in May. NOTE: The original idea of "trait characters" was shared by kindergarten teacher Christy Conner (Marion, IN). This particular second grade classroom had looped with their teacher. So the 6-Trait introduction in the fall was more of a reintroduction. Consequently, the initial bulletin board included minimized images of the six different picture book covers and song lyrics the students had learned the previous year. 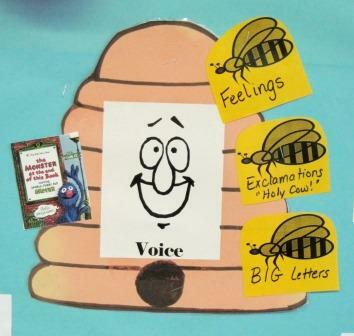 With a strong foundation established in first grade, the traits were reintroduced by reading the SAME picture book to show evidence of all six traits--Julie Brinckloe's Fireflies! Each day the same text was read/referenced, followed by a discussion on how the trait was demonstrated. Since the same book was used for the trait reintroduction, a minimized image of the Fireflies! 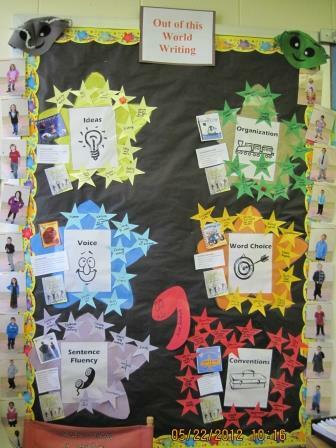 book cover was added to every trait star on the bulletin board. The first photo represents the bulletin board in September. After a year of explicit mini-lesson teaching, you can see all the "star" skills added to the trait bulletin board by May within the second photo. 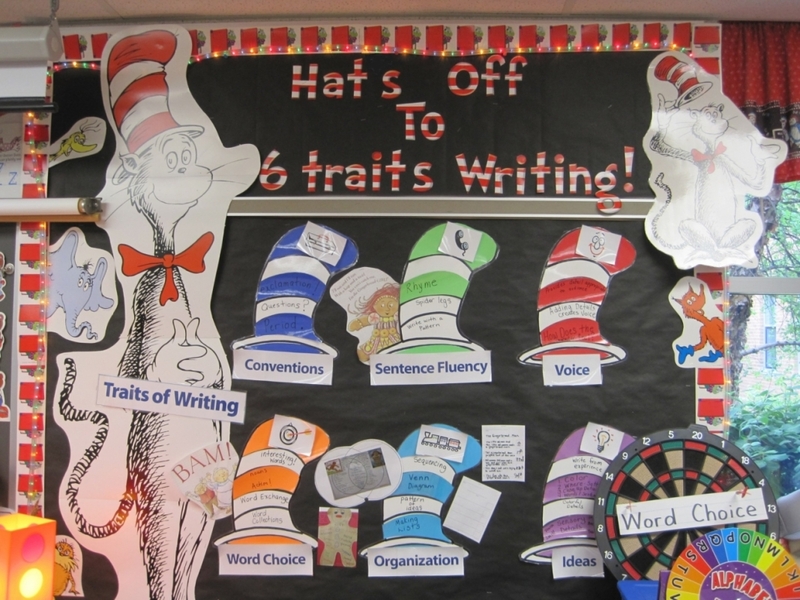 Using a beloved character, Montpelier Elementary (Montpelier, IN) kindergarten teacher Amber Crabtree introduced the 6 Traits with The Cat in the Hat. Each trait was added with a hat and labeled by cutting up the 6-Traits poster. As additional skills were taught in explicit mini-lessons, they were added in the stripes of the trait hat. Using her William Tell Elementary (Tell City, IN) classroom theme "We Are a Team," second grade teacher Sarah Miller wanted to build a yearlong 6-Traits display with a similar concept. She came up with "Team Traits." Students looked forward to learning each new trait song and seeing the newest "trait" team member added to the cabinet. In addition, Sarah capitalized on the picture-book read alouds she conducted by adding a photocopy of each book cover to the display. 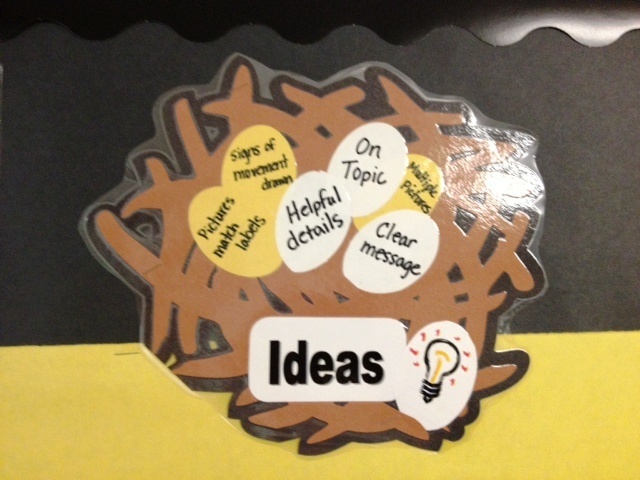 After several specific lessons, the students reviewed the most important point and added it on a trait-icon cutout. 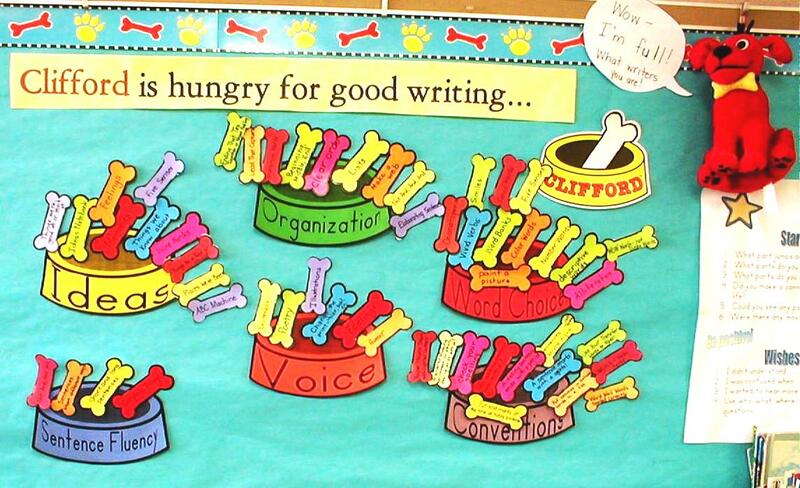 On the first day of school, Bright Elementary (Bright, IN) first grade teacher Linda Schmidt's bulletin board included only the blue paper, the picture of Clifford, and the title "Clifford is hungry for good writing." 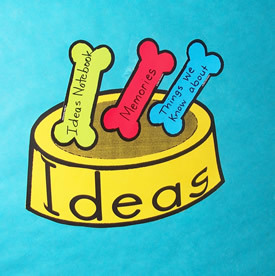 Each day, as Linda introduced her young writers to a writing trait, she added a dog bowl. After 12 days (2 days per trait), her bulletin board looked like this. Throughout the year she continued to work on individual writing skills, adding "bones" to the bowls, indicating to students which trait that particular skill improved. 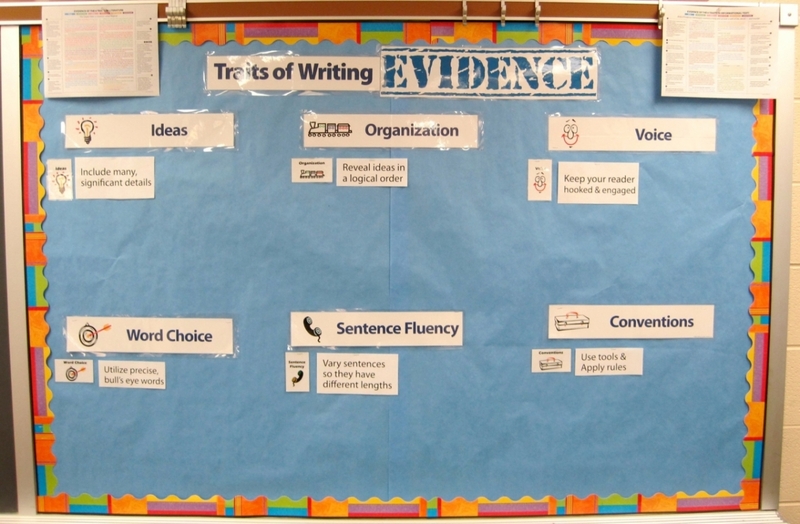 In May, Linda submitted an updated bulletin board image. Look at all the skills her first graders are learning! 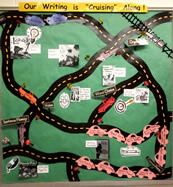 "The Write Way" is Nicole's Osborn's classroom theme at Rosa Parks Edison Elementary (Indianapolis, IN). 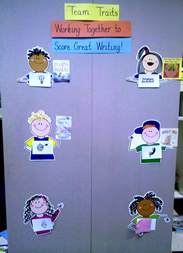 She first introduced each trait to her second graders with a different colored paper. Then she used the pencil icons (blank and stored in the pockets beside each trait page) to record the individual writing skills. As she wrote a specific skill on a pencil, Nicole stapled it to the colored paper as a visual reminder for the students. District 103 (Illinois) teacher Megan Sawa has an effective and efficient 6-Traits bulletin board for her first graders. Using the Smekens icons, she made her own "posters" and laminated them. After introducing each trait/icon to her students, she added key writing skills (per mini-lesson) written with a write-on/wipe-off marker. Her plan is to simply erase all the skills at the end of the school year and rebuild the list with her new students next year. Genius! First grade students at Rosa Parks-Edison Elementary (Indianapolis, IN) learned about the 6 Traits of writing this year with pizza. 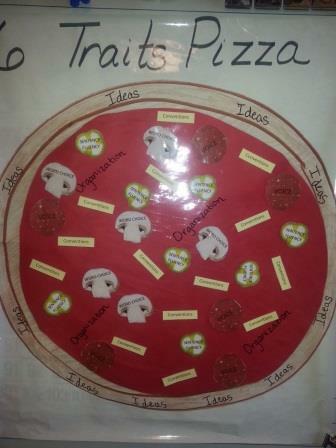 Each trait was connected to pizza with the crust representing Ideas and the sauce as Organization. The other traits were toppings. 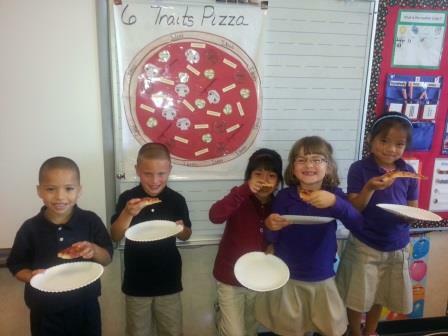 While they were learning about the traits, they were creating a bulletin board pizza display! Along with lead teacher Brittany Braun, the first grade teachers took it a step further (after all the traits were introduced) by surprising the students with a real pizza party. 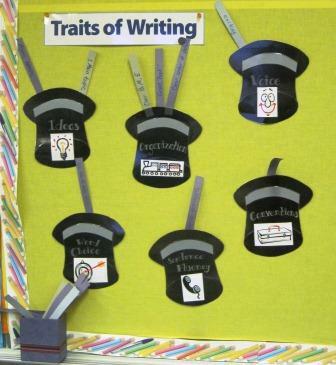 The teachers celebrated all the good writing they'd seen during the introduction of the traits. 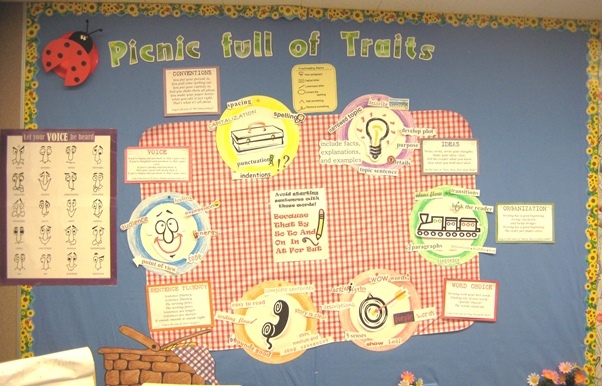 Second-grade teacher Susan Thomas set up a "picnic" full of the 6 Traits and added key writing skills to each trait plate as she presented the skills in mini-lessons. The picnic motif complemented the school-wide "Garden of Learning" theme at Protsman Elementary (Dyer, IN). 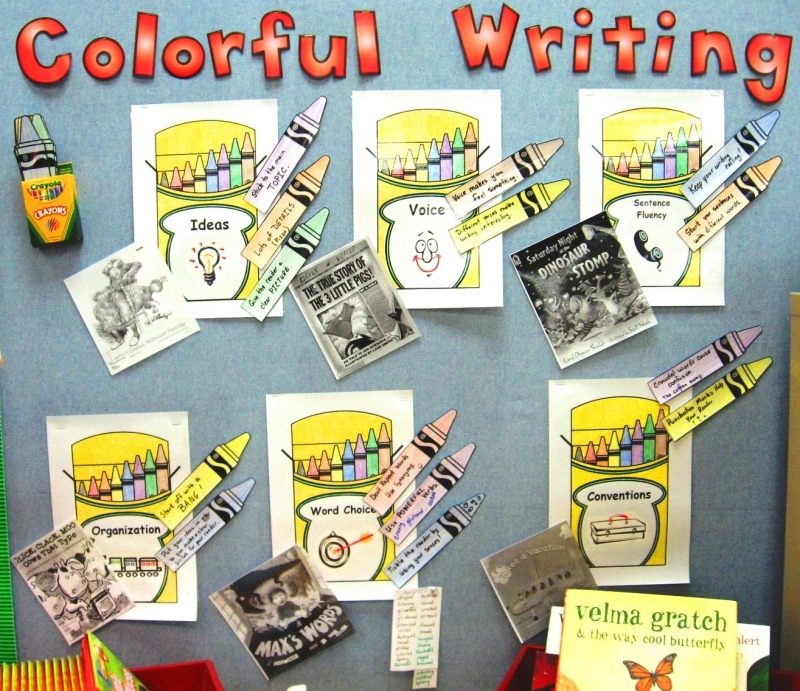 Flint Lake Elementary (Valparaiso, IN) teacher Cindy Douthett used a "crayon box" theme to build her 6-Traits bulletin board. As she introduced a trait with a simple definition, the Smekens icon, and a picture book, she grew her bulletin board with her second graders. 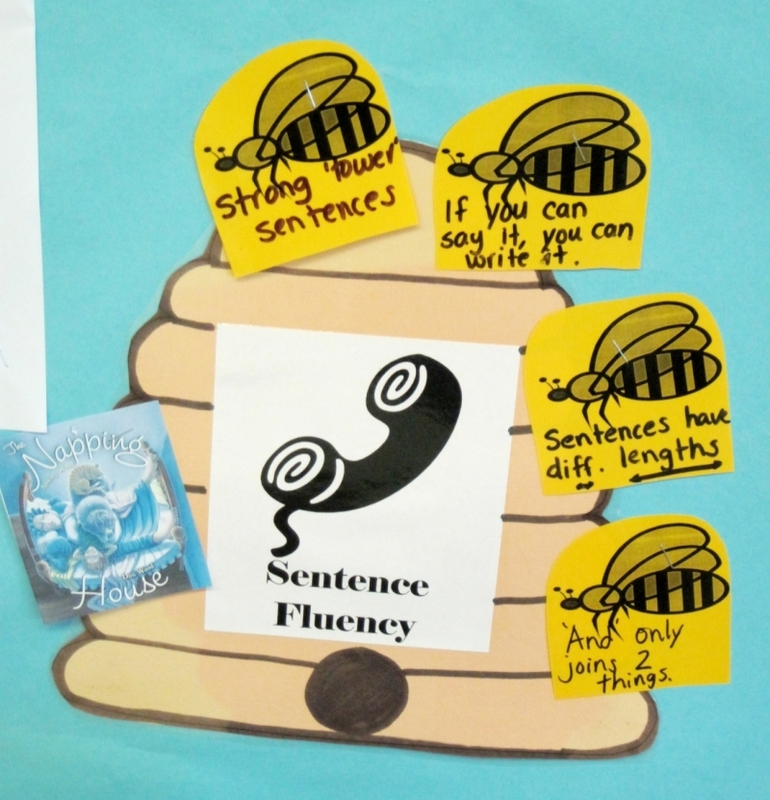 After the traits were introduced, Cindy taught mini-lessons to hone their writing skills. As she did, she stapled the "crayon skills" to each trait/crayon box. 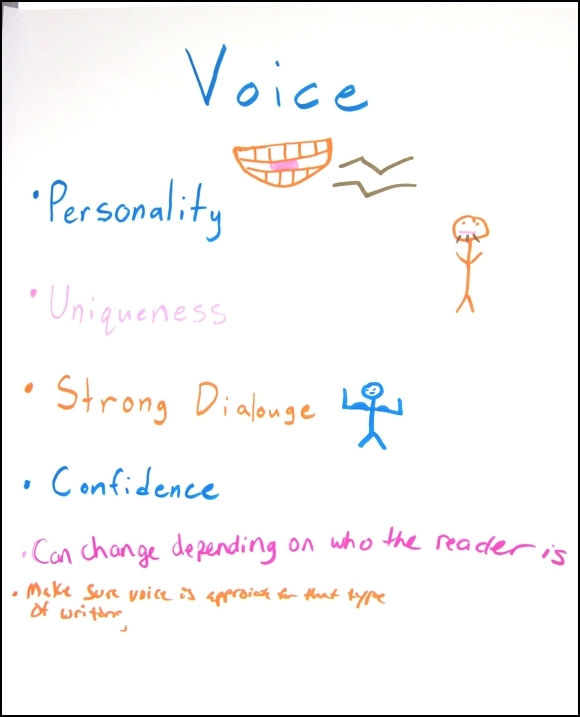 The students not only learned individual writing skills, but they understood the significant skills that fall under each trait, too. Fabulous, Cindy! Thanks for sharing. 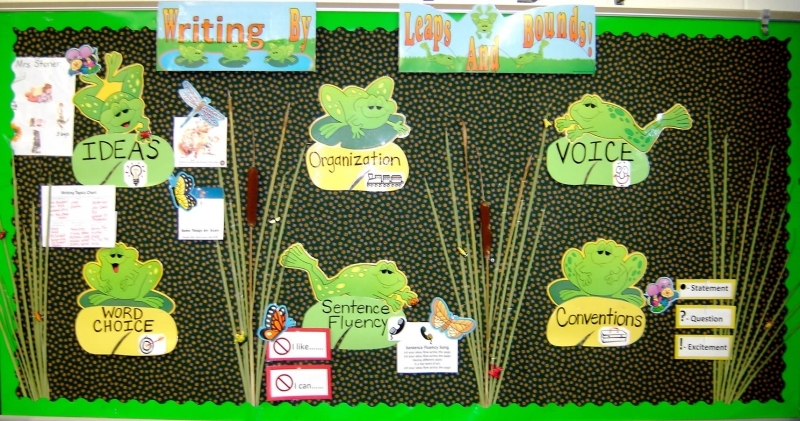 Deputy Elementary School (Deputy, IN) first grade teacher Kathy Stoner wanted to create a 6-Traits bulletin board that carried out her classroom nature theme. She titled it "Writing by Leaps and Bounds" and decorated it with trait-frogs on lily pads surrounded by real cattails. 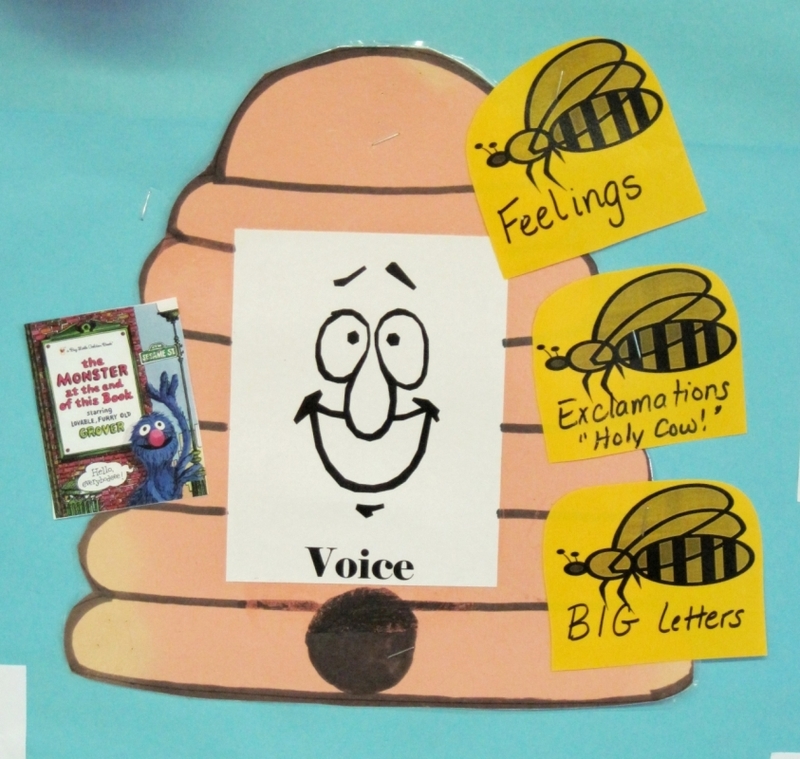 As Kathy introduced each trait, she included the relevant picture book covers, song lyrics, and "bug" skills per trait. 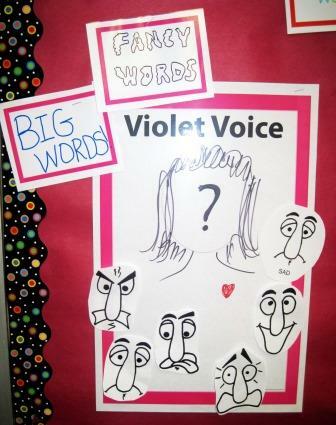 Her students were excited about the bulletin board and loved when they learned a new skill to post on it. 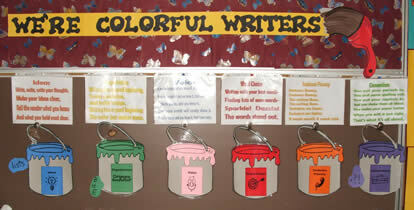 We're colorful writers! 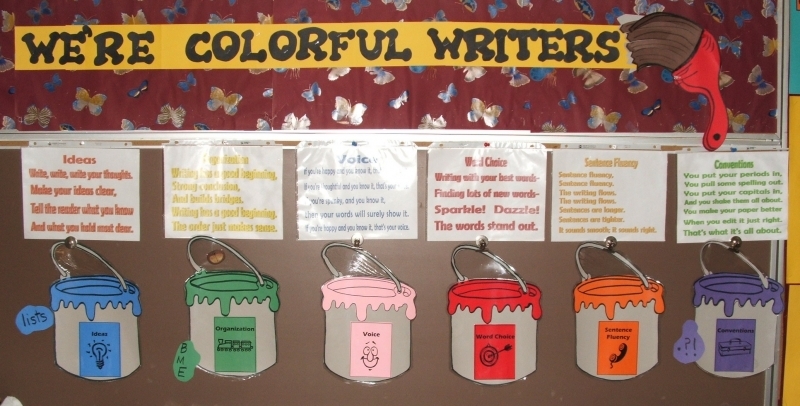 Using the metaphor of paint cans, first grade teacher Mary Menze introduced the 6 Traits to her young writers at Highland Terrace Elementary (New Haven, IN). This isn't a full-size bulletin board. 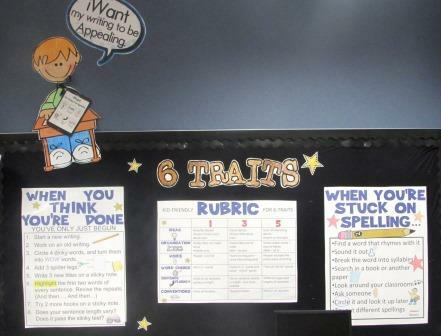 Mary used her chalkboard tacking strip to display the 6 Traits. Great adaptation. The paint cans include the visual icons for each trait to aid her visual learners. The song verses were included above each paint can. Emmanuel-St. Michael Lutheran School teacher Kimberly Cain is a HUGE Colts fan. 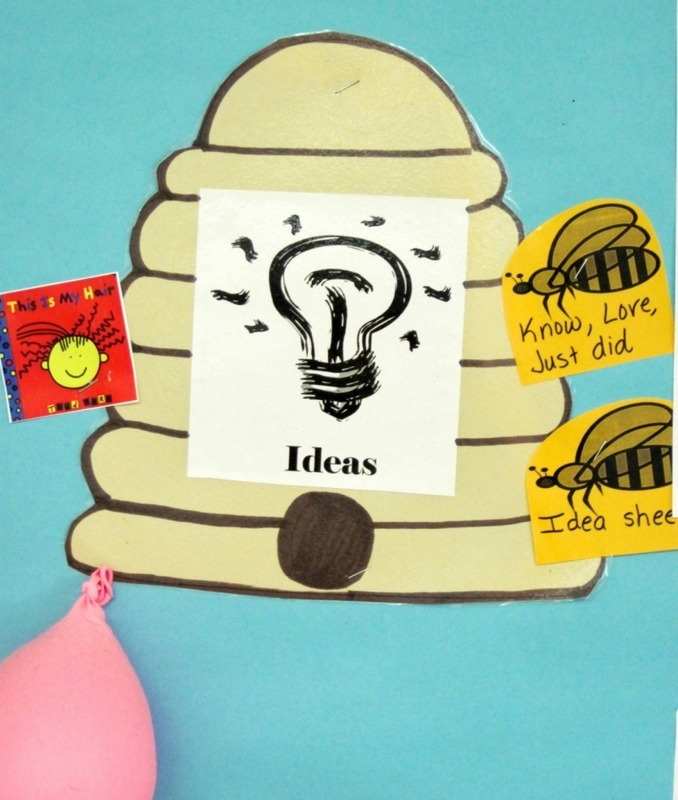 Her first grade classroom operates under the theme "We are a Team." Wanting to incorporate that into her 6-traits bulletin board, she introduced each trait by adding a goal post to the board. Then, as she taught specific writing skills all year long, she added small footballs with the significant writing skills written on them. Second graders at Thomas Jefferson Elementary (Valparaiso, IN) are on the lookout to spot good writing. 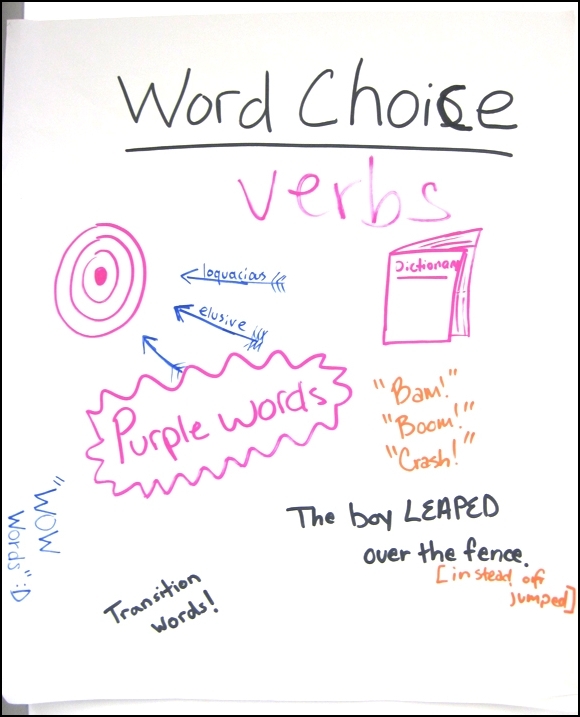 Using pre-fabricated posters from the teacher store, teacher Heather Wells added skills to each trait with a write-on/wipe-off marker. This allowed her to then erase the posters and rebuild the bulletin board again with her class the next school year. Genius! 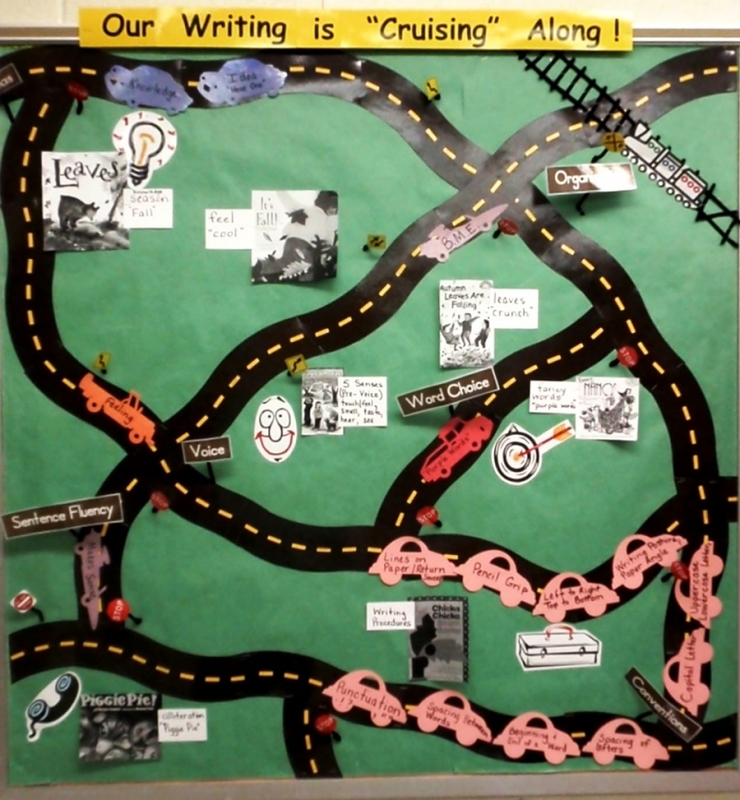 Deputy Elementary School (Deputy, IN) kindergarten teacher Jennifer Amburgey created a 6-Traits bulletin board theme of Our Writing is Cruising Along! The brown street signs are the trait icons. 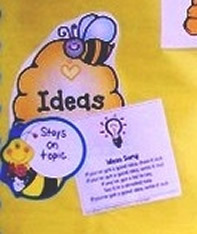 The focus skills are written on the sides of the different trait cars, like advertisements you might see on the sides of a bus. 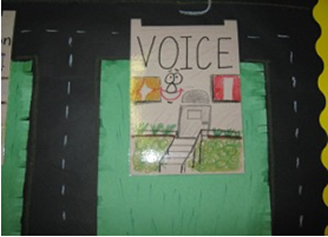 She also added "billboards" along the road--the picture book covers that correspond with her trait lessons. 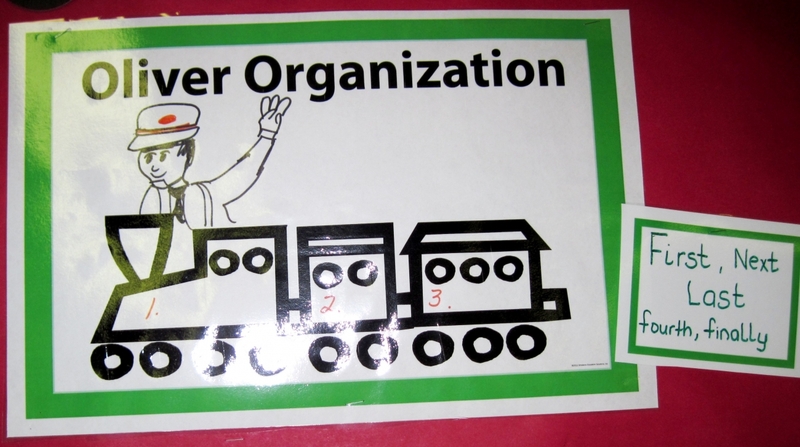 When considering her bulletin board theme, Kimberly played off the school-wide theme: journey. 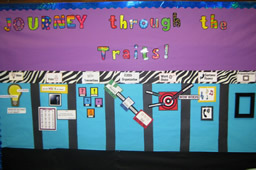 Mirroring that concept, she started her "Journey Through the Traits" bulletin board. 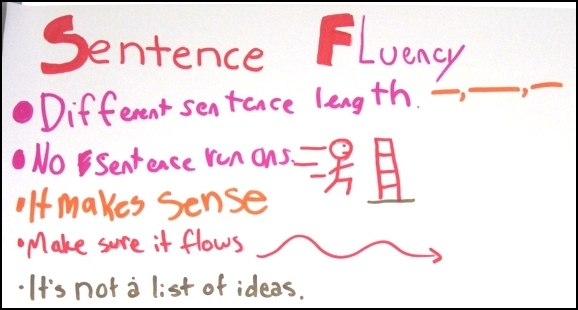 Promoting the traits with words and pictures, Kim incorporated the trait icons into each writing lesson and continually referenced them during her Writer's Workshop. 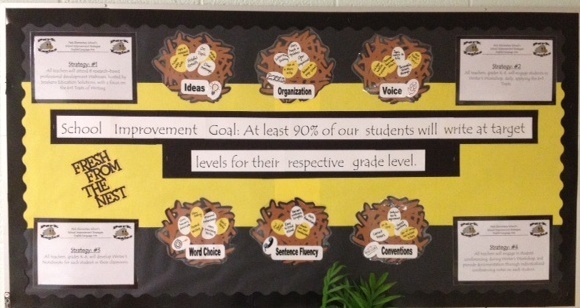 Since Marilyn Scott's Title I classroom at North Decatur Elementary (Greensburg, IN) already had an owl theme, she created a yearlong 6-Traits bulletin board to fit. 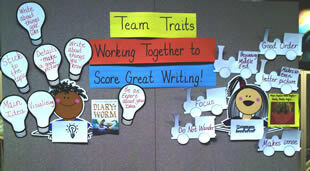 Marilyn works with K-6 writers throughout the day, so she is adding a wide range of skills to the trait-based display. 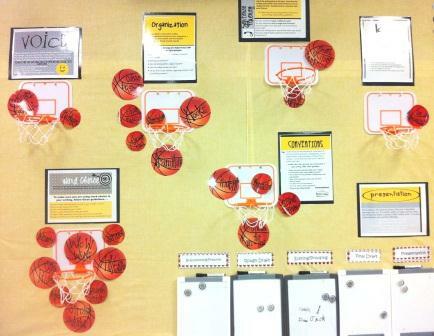 Terri Brooks from South Elementary (Upland, IN) made a 6-Traits mobile for each of the primary elementary classrooms. 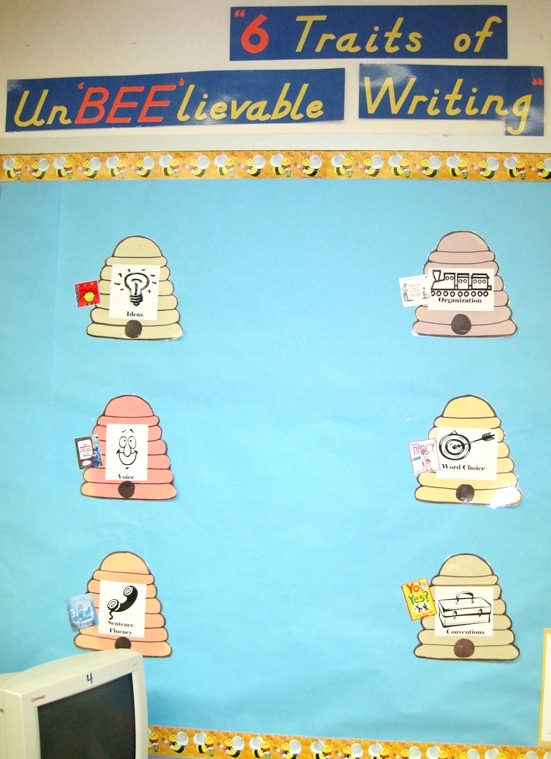 Not only did the consistent icons and color scheme help young writers remember the traits as they moved from grade-level to grade-level, but the mobile concept was a great way to display the traits without taking up an entire bulletin board. What a space saver! 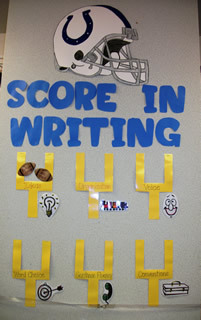 Fifth grade teacher Jenny Hanneman provided a team/sports theme for her classroom at Holy Family Catholic School (Jasper, IN). 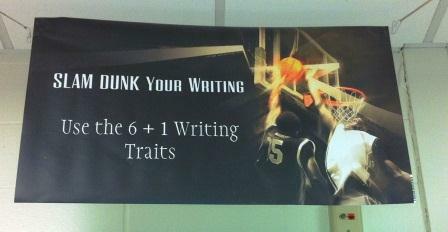 Hovering above her yearlong 6-Traits bulletin board, a poster encouraged students to "slam dunk your writing." As she introduced traits, the basketball goals went up. 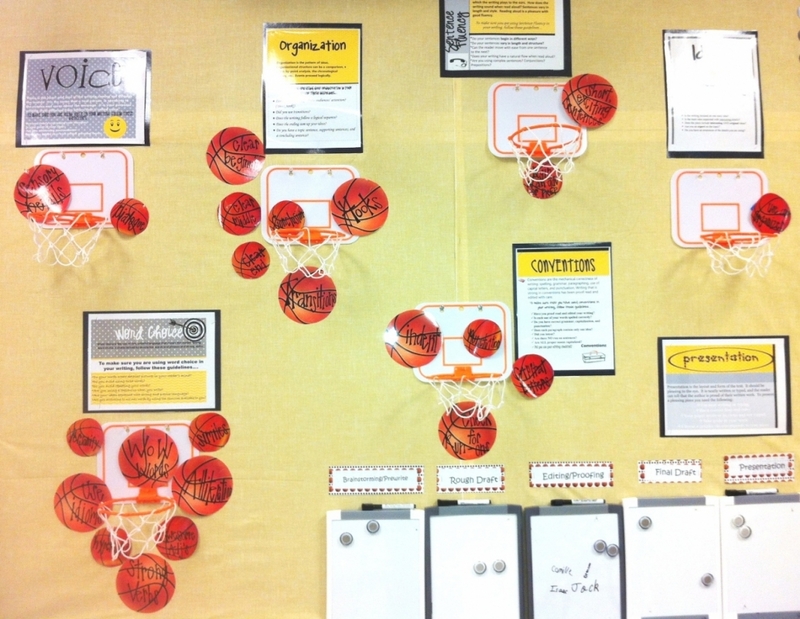 As she taught additional mini-lesson skills, she included basketballs for each key element. Jenny said her students referred to the board as they wrote, and they loved the basketball theme. 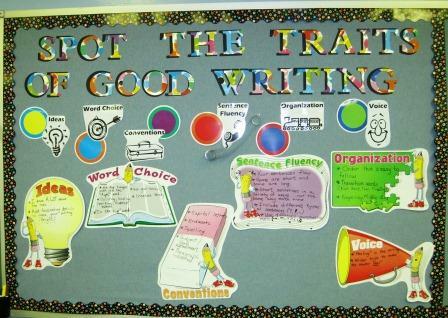 Jenna Hochmeister, fourth grade teacher at Holy Family School (Jasper, IN), shared her 6-Traits bulletin board via Smekens Education Facebook page. Jenna started out with a bare tree with a branch for each of the 6 Traits. She placed leaves on the branches for the skills she covered through trait-based mini-lessons. She continued to add leaves throughout the year. The tree is a great visual for the kids, but it also acted as a way for Jenna to refer to the traits in her everyday teaching. In addition to acting as a log of her trait-based mini-lessons, her bulletin board doubled as a management system. Notice the dry-erase boards under the tree on the left. 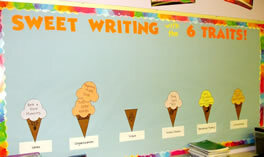 Jenna had her students communicate what stage of the writing process they were at each day (e.g., pre-writing, drafting, revising, ready to proofread with the teacher, publishing). 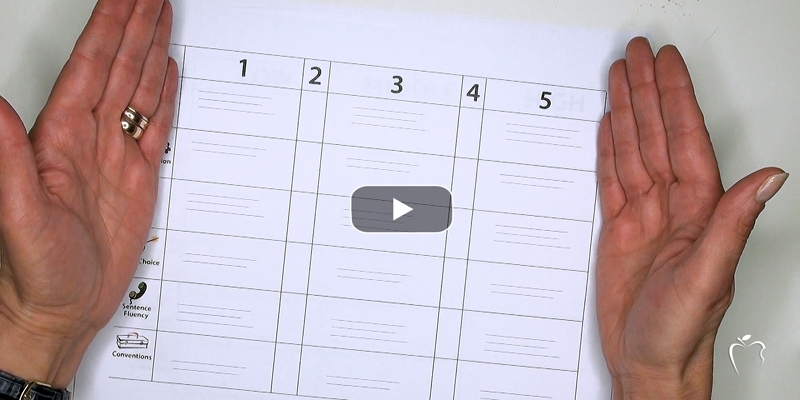 This is an efficient way to get a status check of individuals within the class. Several Bluffton-Harrison Elementary (Bluffton, IN) teachers utilized the same visual--a tree. Second grade teacher Jana Wanner painted her tree on the wall at Bluffton-Harrison Elementary! (She plans to use it year after year.) Once the traits are introduced and the branches labeled, she adds the "leaf lessons." Third grade teacher Cara Crickard didn't have a spare bulletin board or wall space to paint a tree. So she simply utilized flipchart paper. She hand drew a tree with six branches; there is a branch for each writing trait. Then, as she taught new skills within her mini-lessons, she attached a green leaf to the corresponding trait. Park Elementary (Fairmount, IN) had a school-wide focus on the 6 Traits of Writing. 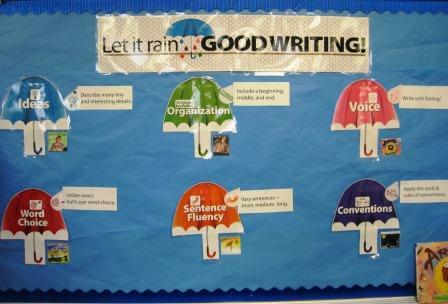 They are not only teaching their students about the six researched ingredients of "good" writing but also educating their students' parents as well. 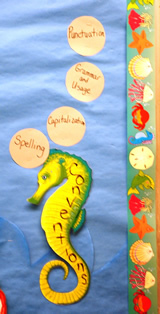 As part of their plan, Megan McAdams (resource teacher) created this bulletin board outside the elementary main office. Check out the skills listed on the trait eggs. 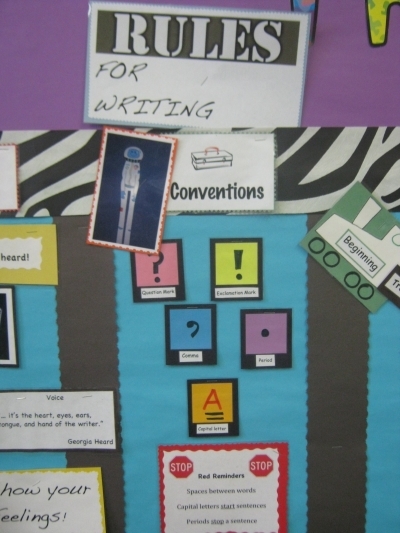 Knowing this is a school-wide bulletin board, I love that that they included writing skills that are relevant to young K-2 writers and other skills that will challenge the strong intermediate writers. 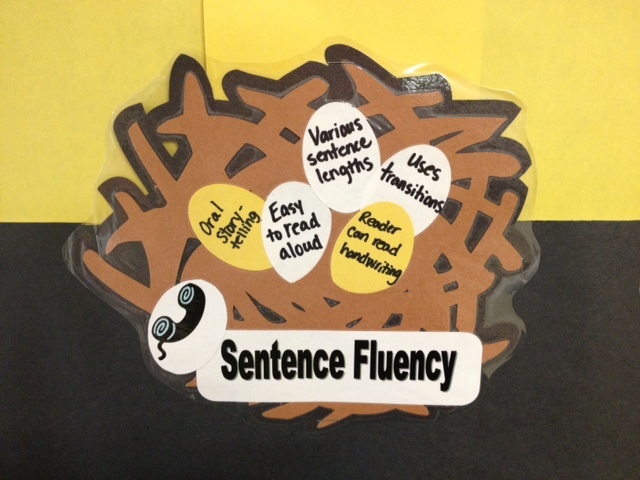 This honors that the common language of the 6 Traits can be applied to all grades and all students. South Creek Elementary (Indianapolis, IN) teacher Nadine Gilkison played off smart technology and apps. She constructed an iPad-shaped bulletin board and made each trait an app. Love it! 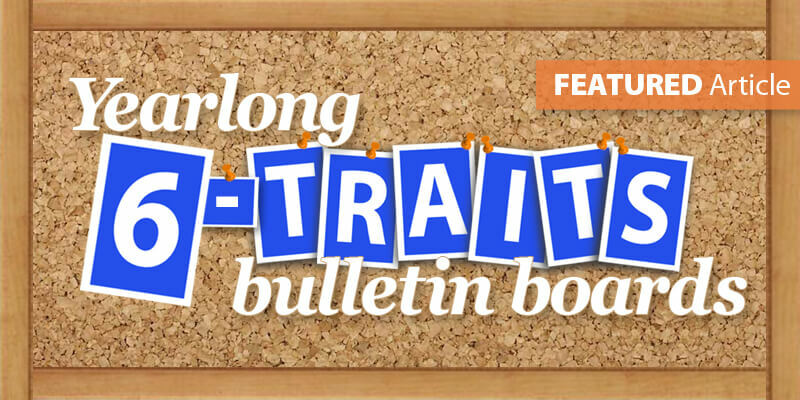 She not only referenced the traits in her lessons on her bulletin board, but she also held students accountable for their growing trait knowledge, too. 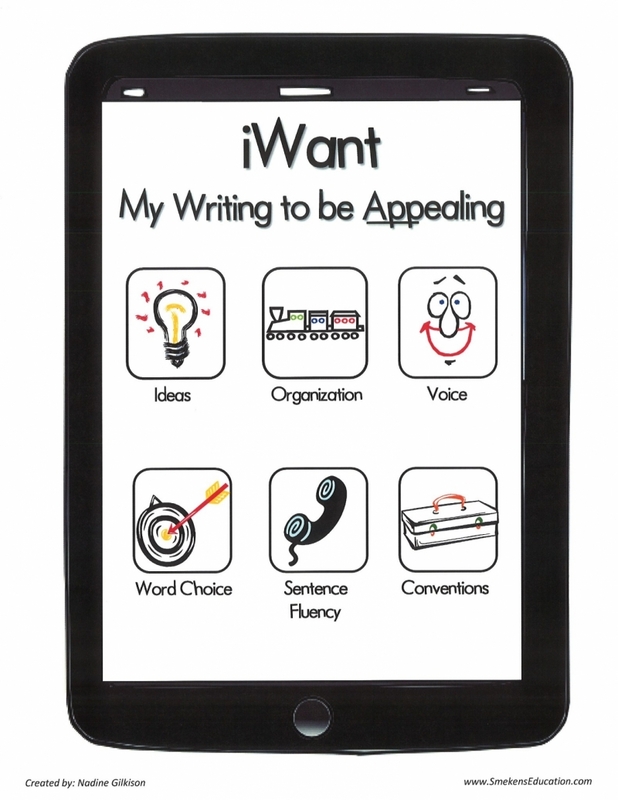 She created a writer's notebook version of the APP-ealing Writing concept. Students maintained a list of the traits and corresponding skills within their personal notebooks. 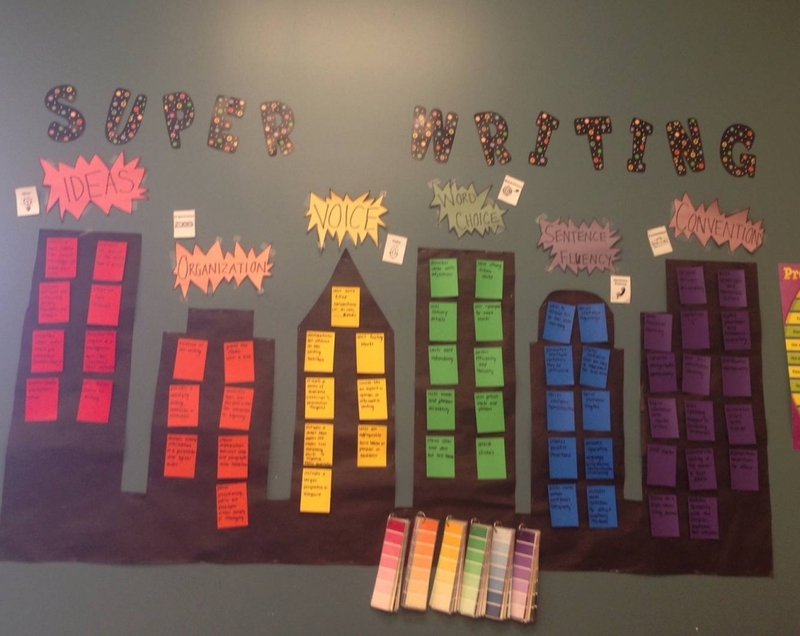 As the year progressed, Nadine also added other writer resources to her visual display--class rubric, expectations for what to do when you're done writing, etc. The school year began, and in Angie Thiery's fourth grade classroom at Northside Elementary (Hartford City, IN), the bulletin board was bare. But with each passing day of her intentional trait introduction, Angie added a Trait Umbrella and read a corresponding mentor text. 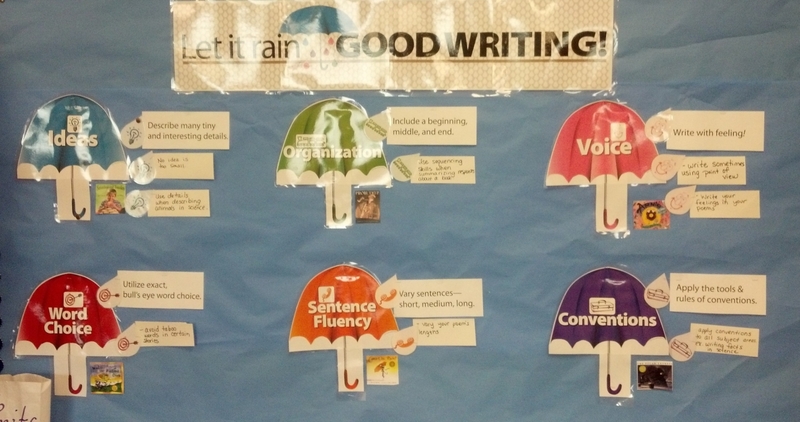 As the year progressed, mini-lessons were conducted and raindrop skills were added. Jenn Will, fourth grade teacher at Thomas Jefferson Elementary (Valparaiso, IN), embraced a magic theme. Each magician's hat is a trait, and then she slowly added wands throughout the year. She writes the skills on the wands (a.k.a. gray strips of construction paper). Take note of her stash of ready-to-go wands in the bottom left of the photo. Fifth grade teacher Amy Becker knew her Ridge Lawn Elementary (Chicago Ridge, IL) students' love of music. 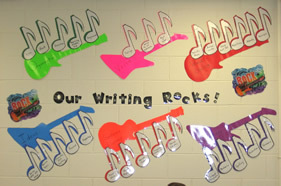 So she created "Rock Star Writing" 6-Traits bulletin board. 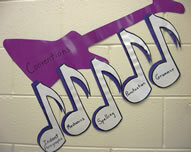 As she taught specific writing skills via mini-lessons, she added music notes coordinating with each trait guitar. Fourth graders in Kristina Connally's classroom at Highland Terrace Elementary (New Haven, IN) learned about the 6 Traits via crayon boxes. Notice how she then spiraled her instruction, adding individual crayons (mini-lesson skills) to each trait. 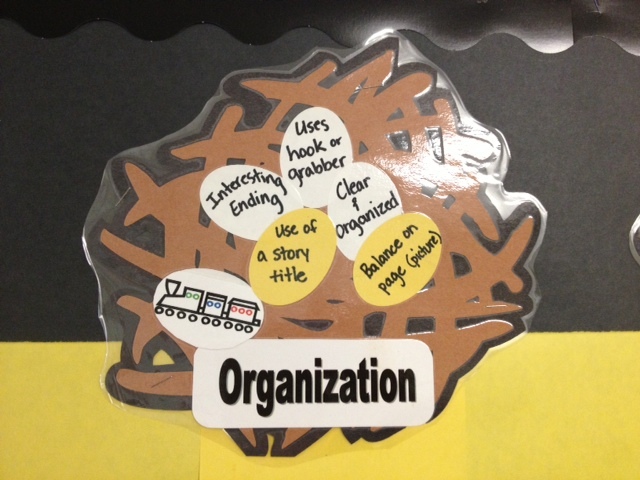 This will help the students remember the little nuggets that go with each trait. 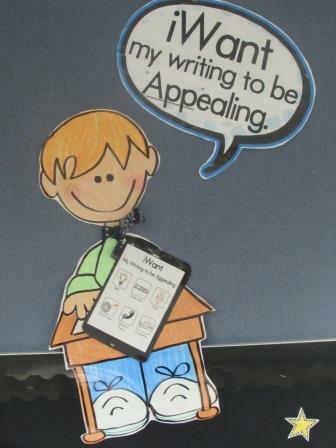 And I love how she let the students do the writing! 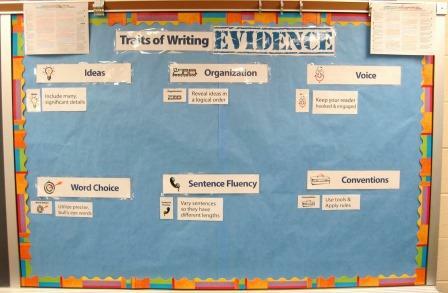 One other noticing within this 6-Traits introduction--do you see what's above her bulletin board? Those are photocopies of the picture book covers she read when she first introduced each trait. FANTASTIC! 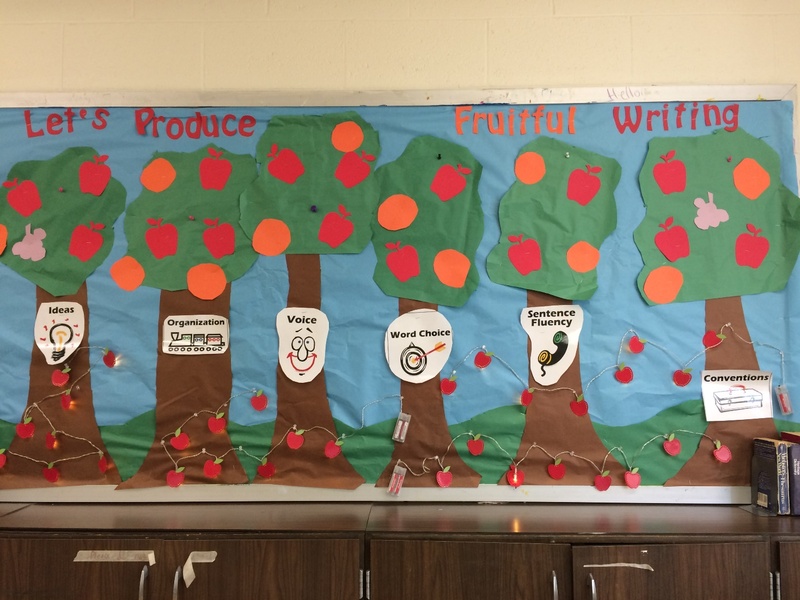 Love the colorful nature of this simple trait bulletin board! Barb Mahnesmith, fifth grade teacher at Smoky Row Elementary (Carmel, IN) printed the mini-trait posters. 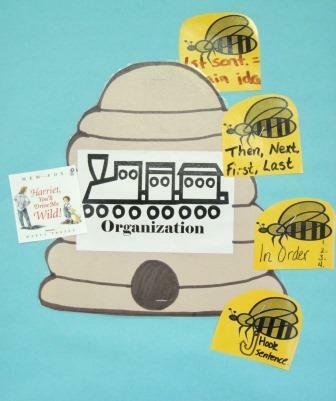 She adhered each icon to colored cardstock and then laminated them. When she first introduced each trait, she did so by defining the trait, revealing the icon, teaching the students the trait song, sharing a writing sample, and building a simple rubric. As the year progressed, she continued adding key mini-lesson skills that coordinated with each trait. 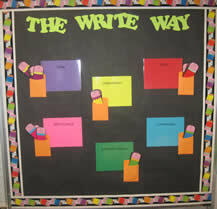 TIP: Every skill she added to the board was already adhered to colored card stock and laminated. She had them all created and stored in Ziploc baggies. Consequently, at the end of the year, Barb can simply remove the trait skills from the wall, return them all to their baggies, and then reveal them one at a time next school year. Genius! 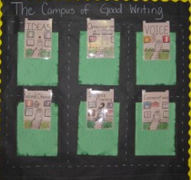 Charter School of the Dunes is adopting the No Excuses University example, so fifth grade teacher Laura Charpentier decided to go with a college theme for her 6-Traits bulletin board--"The Campus of Good Writing." Her trait skills were added on yellow diplomas since the school is sponsored by Purdue University. 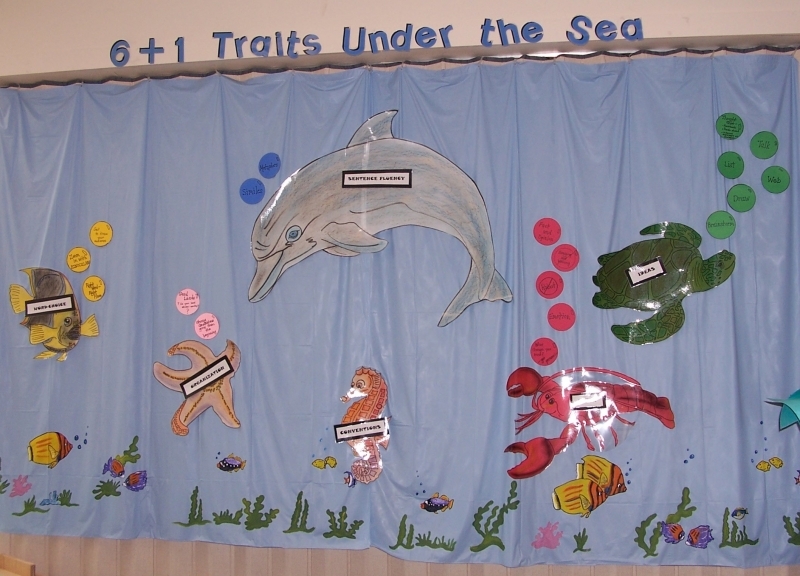 Churubusco Elementary (Churubusco, IN) teachers Amy Bianski and Michelle Simmons used a light blue shower curtain and painted a "6 Traits Under the Sea" scene. Each underwater creature is labeled as a different trait. And a color-coordinating set of bubbles identifies the key facets of each trait. 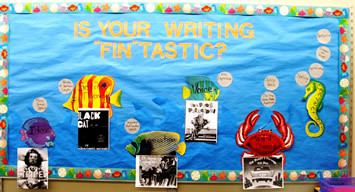 Spinning off the underwater theme, Christina Butts built a "Fin-tastic" writing bulletin board within her fourth/fifth grade classroom at Highland Terrace Elementary (New Haven, IN). 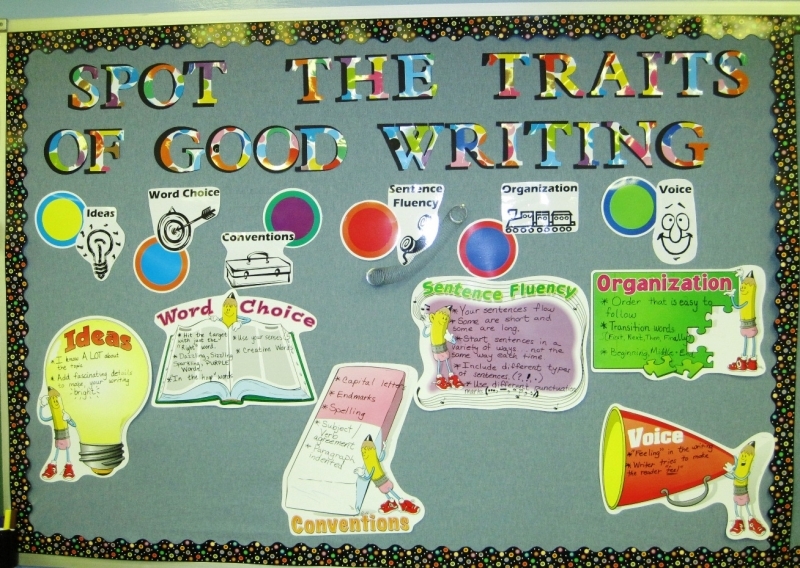 Robyn Schaetzel created a "Tune into Good Writing" 6-Traits bulletin board in her fifth grade classroom at Kankakee Valley Intermediate School (Wheatfield, Indiana). It shows six "iPods" each representing one of the six traits. As she spiraled through the traits, she added information about the specific writing skills they learned to the iPod screens. R.J. Baskett Middle School (Gas City, IN) language arts teacher Rebecca Meek used her bookshelf instead of a bulletin board. The display showcases the 6-Traits icons and toy triggers she uses to introduce the traits at the beginning of the year. 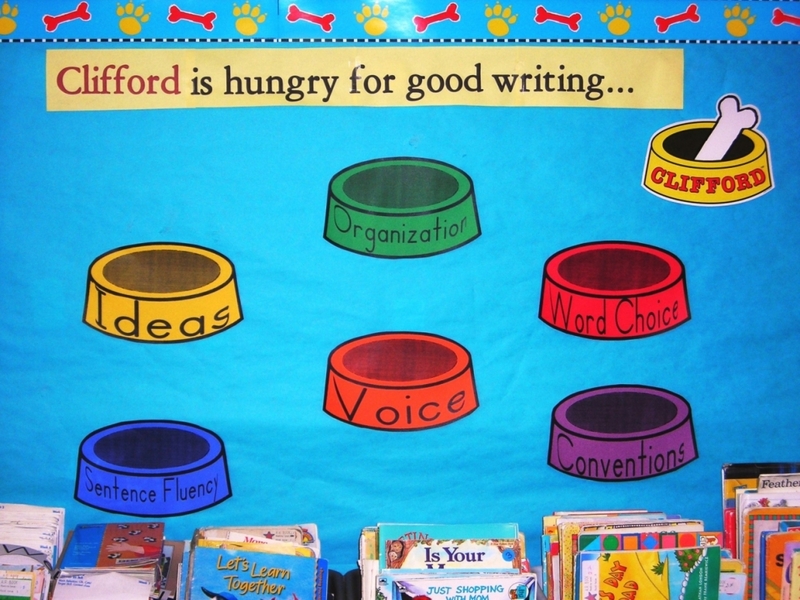 Placing the writing with the reading is a great way to emphasize that readers read writing and writers write for readers. 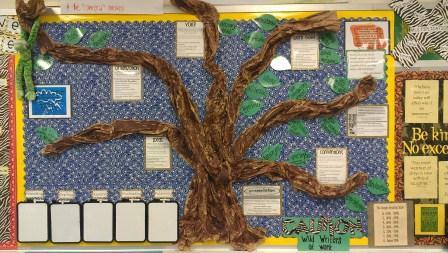 Stacey Rubin of South Bend Hebrew Day School (South Bend, IN) started the year with six apple trees on her bulletin board. Each "trait tree" includes apples on which she will note trait-specific skills. (She also found apple lights at Target to spruce up the display.) Stacey is in a unique situation in that she teaches all of the 6th, 7th, and 8th graders, but only wanted to create one bulletin board. 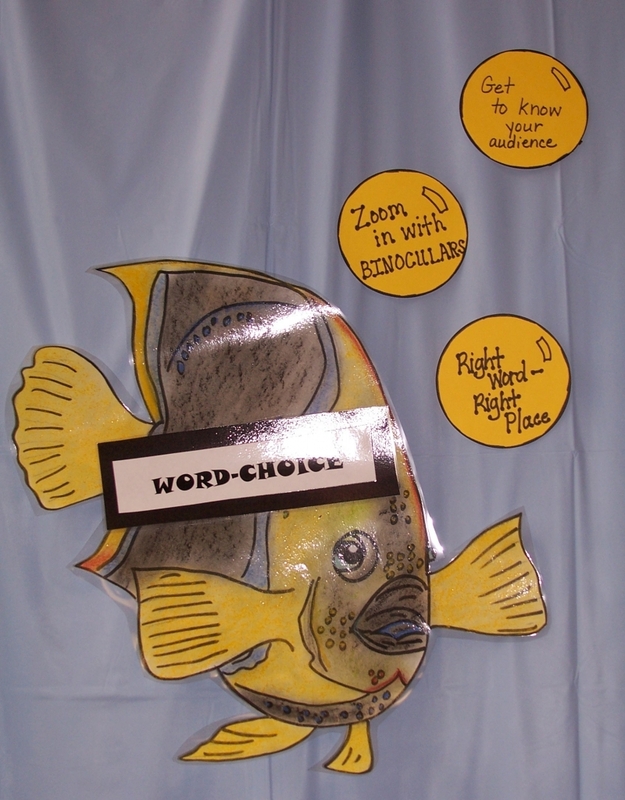 Consequently, her display will include skills from all three grade levels. She's hoping to intrigue her younger students with a sneak peek at the skills they will learn in future years. Cindy Summers begins the year by placing the large gears on the bulletin board as she introduces and discusses each trait with her sixth graders at Riley Elementary (New Castle, IN). This concept helps her explain that the gears work smoothly together. Using all 6 Traits, the students' writing pieces will be well written, flow smoothly, and be interesting. 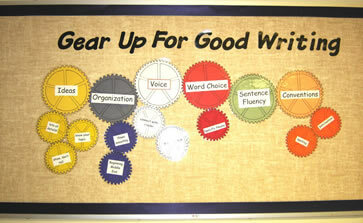 The smaller gears are added as she discusses key skills within each of the traits throughout the year. 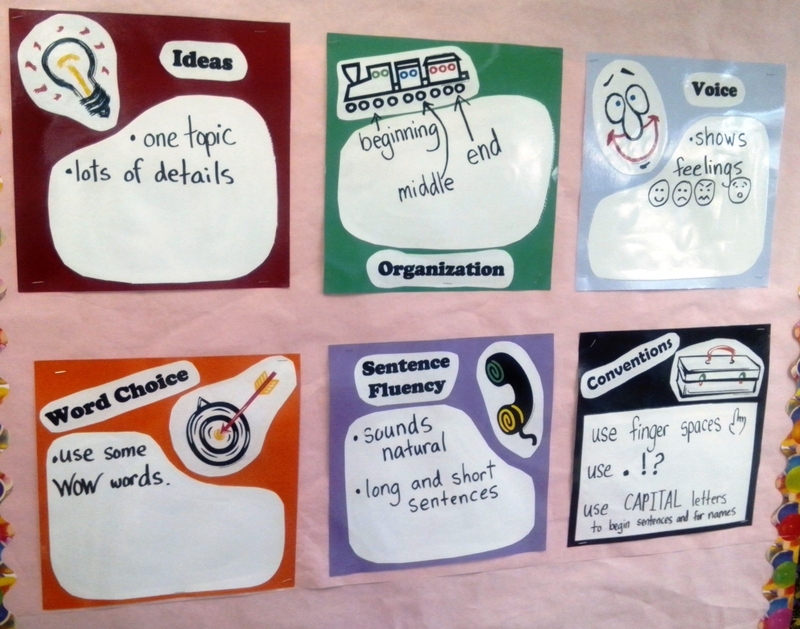 NOTE: Cindy's students help her come up with wording for the smaller skills (smaller gears). She wants it to be as kid-friendly as possible. Excellent concept, Cindy! 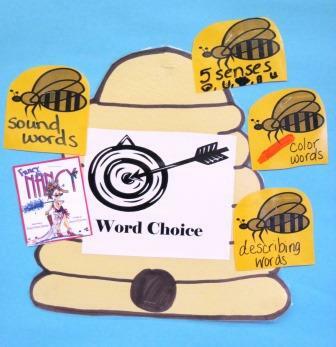 Blackford Middle School (Hartford City, IN) teacher Jami Jones used the same two mentor texts to introduce each of the six traits of writing. She selected a literature example--"The Carpet Fitter"--and an informational text passage--"Body of Evidence." Students reread excerpts of the same passages each day as she dissected the traits in action. 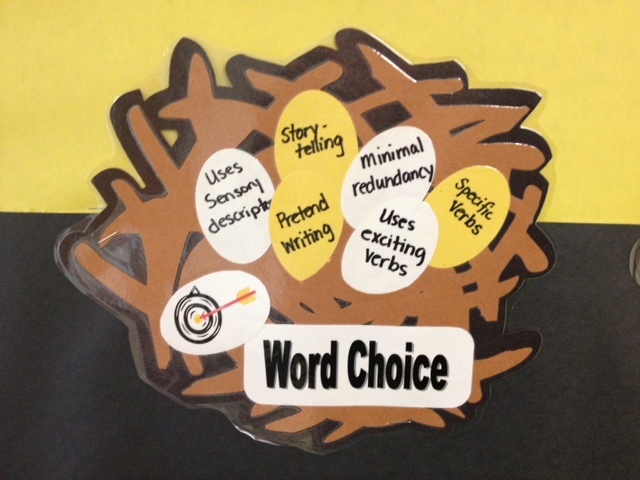 By doing this, Jami was able to reveal how the traits can be applied to different text types and writing purposes. From this early-in-the-year photo, you can see that she simply cut up the 6-Traits poster to create section headers for each trait. How easy is that? And then, as she taught more skills, she typed them up and added them to the board using the mini-trait icons. 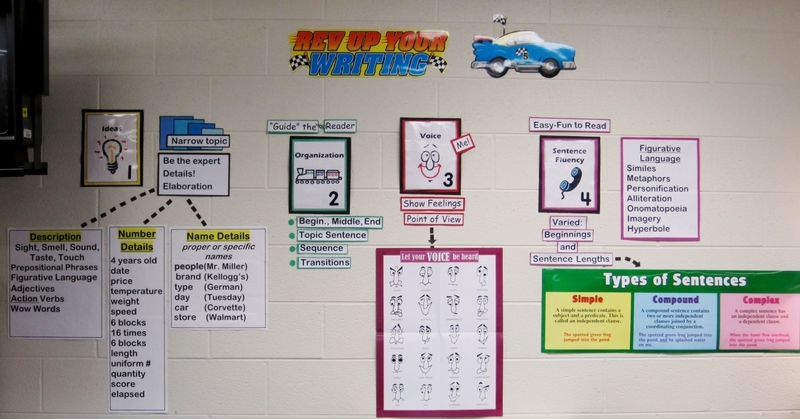 Using the downloadable trait mini-posters, a Belmont Middle School (Decatur, IN) teacher built a display on the wall of her ELA classroom. 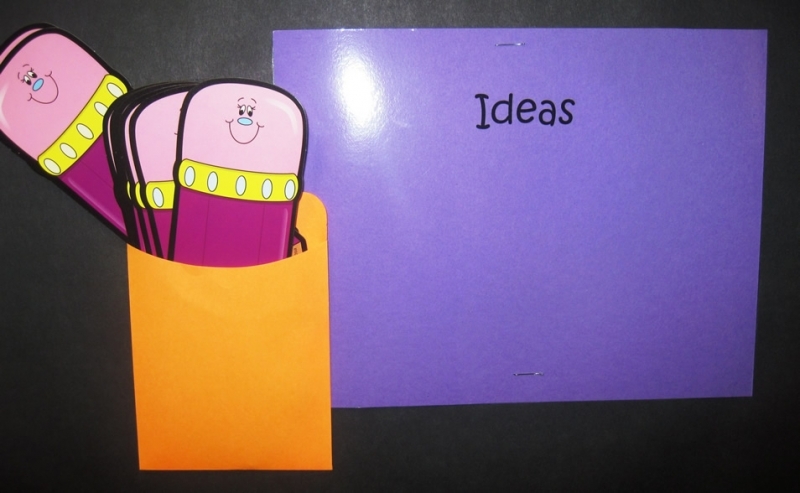 She simply added relevant resources and reminders that corresponded with her trait-based mini-lessons. Notice the simplicity of this resource. 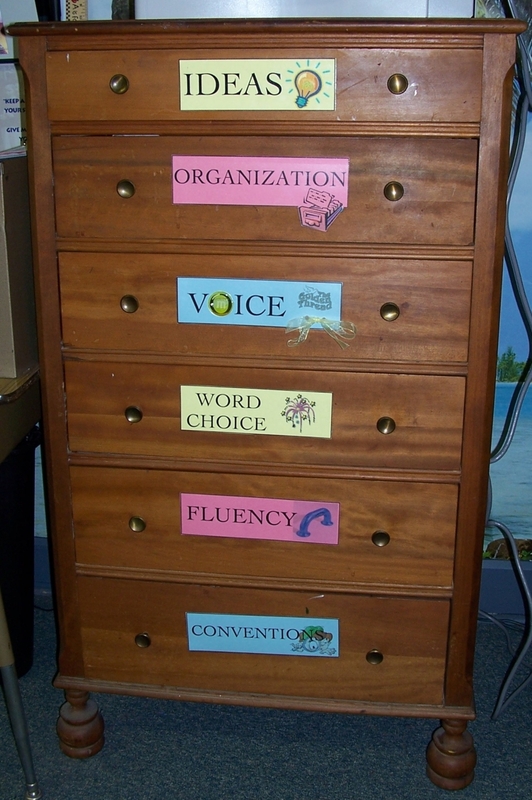 The teacher can easily maintain such a visual display, and students can quickly access tips and tricks. 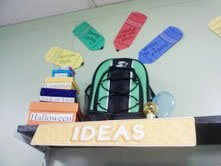 West Vigo Middle School (Terre Haute, IN) teacher Melanie Beaver utilized a shelf to display her 6 Traits with backpacks. (FYI: These "backpacks" are really thermal lunchboxes from WalMart.) 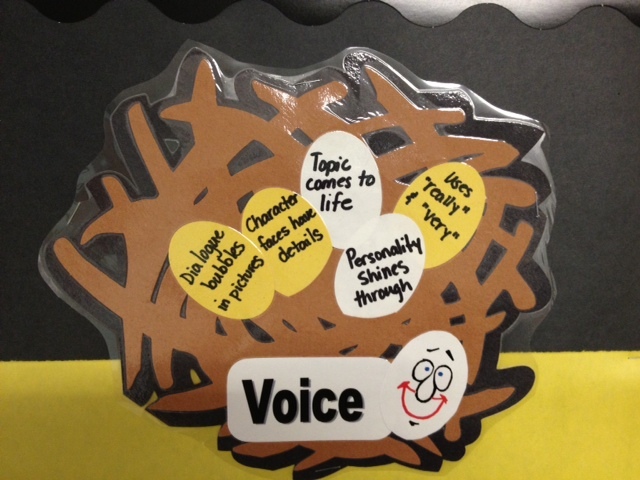 Melanie built her visual display with concrete triggers next to each trait-backpack (e.g., lightbulb for Ideas, a train for Organization, a target for Word Choice, etc.). 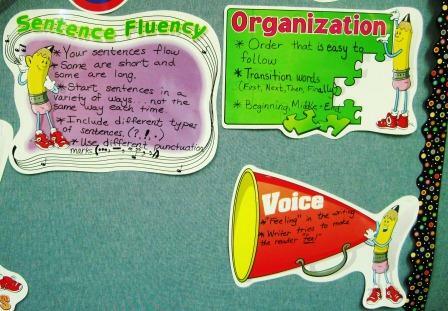 And as the year progressed, she also added relevant skills on the wall behind the shelf display. 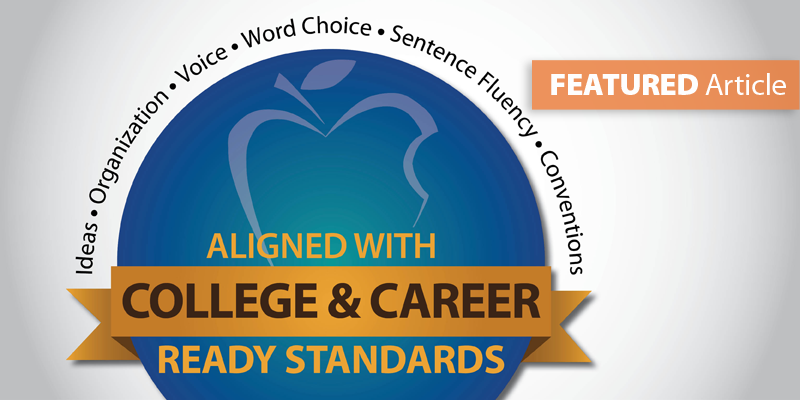 For more information, read "Visual Displays for Upper Grades." 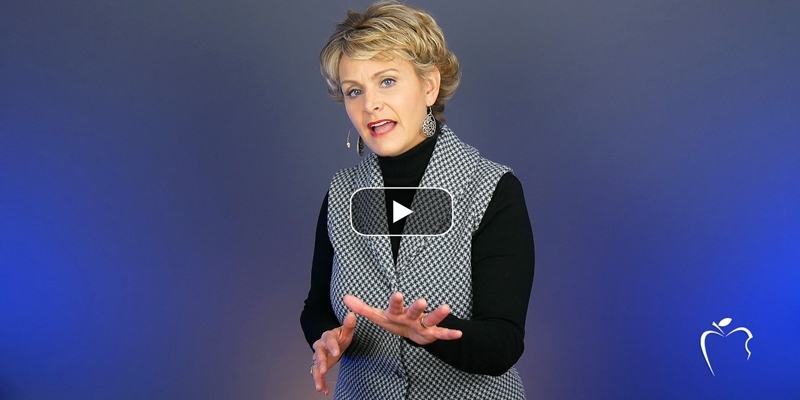 If the elementary teachers are teaching the 6 Traits, it's likely that MS/HS teachers don't have to plan for such a long and thorough trait introduction. 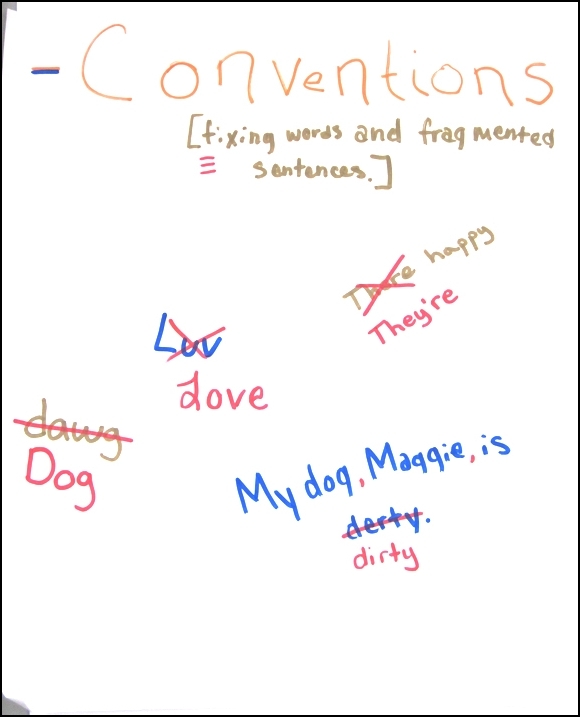 However, there is still great value in re-establishing common language. So, consider re-introducing the traits with a faster approach. Early in the school year, Sherry put the students in groups--one group per trait. 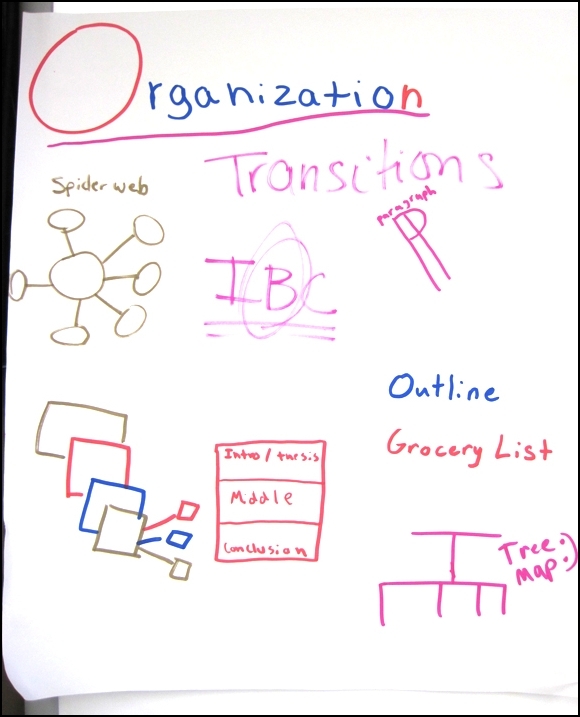 Armed with markers and chart paper, the students in each group were to make a poster that included everything they remembered about the trait. 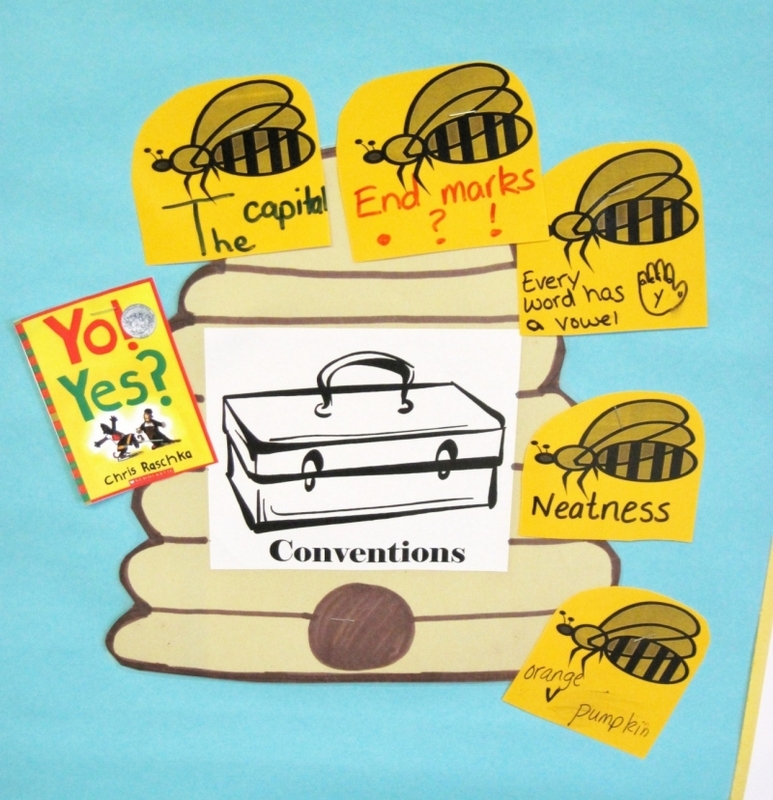 Many included skills, icons, memorable lesson triggers, etc. This proved to be a great assessment. 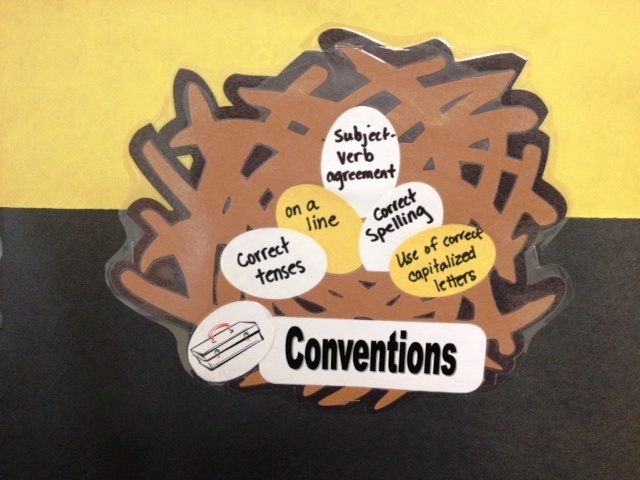 Sherry was able to determine what students retained and what they needed next in their trait-writing knowledge. 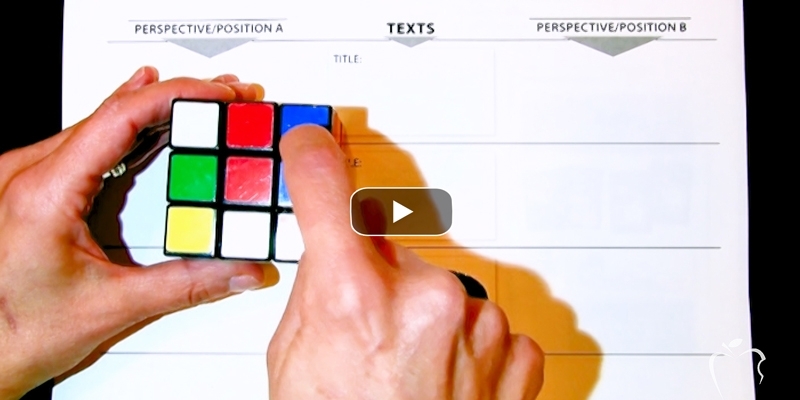 NOTE: Plan to execute this activity within all of your ELA classes. 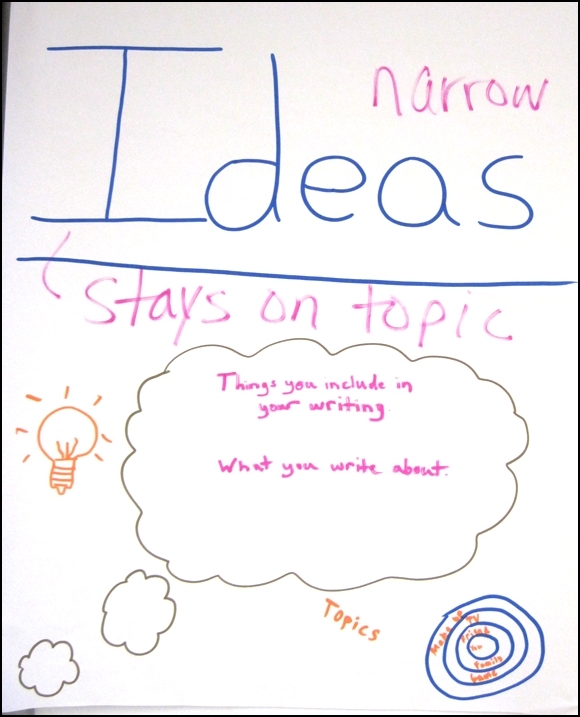 The following day, have each class vote on the "best" Ideas poster, Organization poster, Voice poster, etc. Keep the "winning" poster per trait posted and pitch the rest. 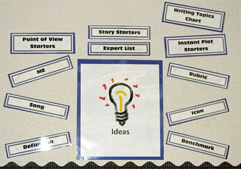 Now you have a kid-friendly display that you can write additional skills onto as the year progresses. Article originally posted May 30, 2008.